Luis Figo is a Portuguese soccer player that is without a doubt one of the best soccer players to ever emerge out of Portugal. He was born on November 4th, 1972 in Lisbon where he started his soccer playing days with the local youth team Sporting CP. Luis Figo biography shows that he is one of the few players to play for arch rivals Barcelona and Real Madrid during his 20 year soccer career. Growing up in a soccer town of Lisbon it was no surprise that as a kid Luis Figo would start kicking the soccer ball at a very early age. Luis Figo biography shows that he started training with the local giants Sporting CP at the age of 11 and earned his first team debut in 1991 at the age of 17. Although his first team appearances were rare, Luis Figo had a long soccer career ahead of him and by the time he turned 20 he became a regular first team starter for Sporting CP. Luis Figo biography shows that coming into first team helped Luis Figo showcase his flair, skills and leadership on the field instantly making him a sought after player by many top clubs. In 1995 Luis Figo biography shows him being involved in a dispute between Italian giants Juventus and Parma after signing a contract with both teams. This dispute resulted in Italian two year transfer ban on Figo, stopping all the possible negotiations with Italian clubs. After the ban stopped any move to any Italian soccer team, Luis Figo Bio shows that FC Barcelona with head coach Johan Cruyff showed interest in Luis Figo eventually signing him for £2.25 million | $3 million transfer fee. Coming to Barcelona is the best decision of Luis Figo's career because this is where his career really took off under the guidance of great Johan Cruyff. Luis Figo biography shows that during his time at FC Barcelona, he had won many titles including the 1997 UEFA Cup, 2 La Liga titles, 2 Copa del Rey titles, 1 Supercopa de Espana and 1 UEFA Super Cup. He earned Barcelona captain's armband, an honor that is rarely given to a player that is not Spanish. After five successful seasons appearing 172 times and scoring 30 goals for Barcelona, Luis Figo could pick any club he wanted with the form he was playing in at the time. The biggest shock came when Figo decided to continue his soccer career at Barcelona's arch rivals Real Madrid. To everyone's surprise, Luis Figo soccer biography continues with the Barcelona rival Real Madrid. Luis Figo biography shows him signing with Real Madrid after being offered the record transfer sum of $46 million for 5 years of his playing services. During his first season with Real Madrid many had though that Luis Figo's career is done. His former Barcelona fans hated him for his betrayal, booing him and throwing objects at him every time he went up to take a corner kick or throw in, while the Real Madrid fans could not accept him because of the fact that he came from their rival Barcelona. On top of being hated by both Barcelona and Real Madrid fans, Luis Figo was haunted by injuries during his first year at Real Madrid. With everyone writing Luis Figo off and considering him as a "done footballer" during his first season at Real Madrid, it was coach Vicente Del Bosque that believed in Figo making him a key player in his squad to everyone's surprise. He started winning Real Madrid fans by giving every game his best and helping Real Madrid to 2 La Liga titles, 2 Supercopa de Espana, 1 UEFA Champions League title, 1 UEFA Super Cup and 1 Intercontinental Cup. Still playing in great form, Luis Figo decided it was time to move on and play in another top league deciding on Seria A and Italian club Internazionale. After his contract expired with Real Madrid in 2005, Luis Figo joined the Italian side Inter Milan as a free agent. This meant that Figo will finally get the chance to play in Italy, a chance that came even before Barcelona and Real Madrid but fell through after the dispute between Parma and Juventus. During the summer of 2008, Inter Milan appointed Portuguese Jose Mourinho as the manager which pleased Figo as he would have several Portuguese teammates during his last years of his soccer career. Luis Figo biography shows that he won 4 consecutive Italian Seria A titles, 1 Coppa Italia and 3 Supercoppa Italiana. The most memorable time in Italy for Luis Figo was parhaps the winning free kick he scored in extra time of Supercoppa Italiana against Roma in the final. Luis Figo biography as a professional soccer player comes to an end in a farewell match on May 31st, 2009 against Atalanta. Inter Milan long time captain Javier Zanetti insisted that Figo wear the team captain's armband in his last match where he received a standing ovation from the crowd when he was substituted by Davide Santon. Luis Figo is part of the Portuguese Golden Generation which won the FIFA World Youth Championship in 1991. This same year he also made his international debut for Portugal's senior team against Luxemburg on October 16th, 1991 in a friendly that ended 1-1. He was only 18 years old at the time. 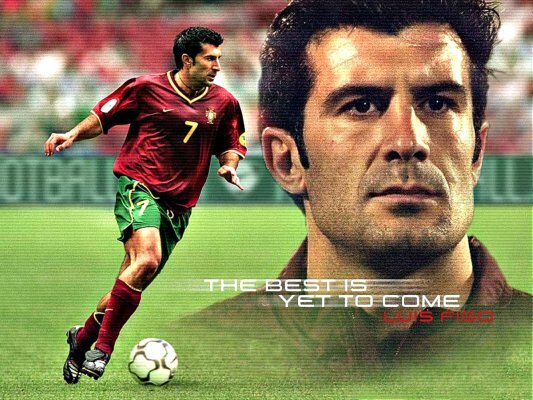 Luis Figo became a regular first team player making appearances for Portugal in Euro 1996, Euro 2000, Euro 2004, 2002 FIFA World Cup and 2006 FIFA World Cup. Luis Figo biography shows that he announced his retirement from international soccer after the Euro 2004 final upset-defeat by Greece. In 2005 he reversed that decision saying that he will retire from international soccer after the 2006 World Cup. He captained the Portugal squad in 2006 World Cup, leading them to the simi-final where Portugal lost to France, after Figo's former teammate Zinedine Zidane scored a winning penalty. This semi-final finish was the best finish for Portugal in the past 40 years. Figo did not start the match against Germany for the third place but would come in as a substitute for Pauleta, taking the captains armband one last time and setting up a consolidation goal for Nuno Gomes in the 88th minute. Luis Figo bio on international stage comes to an end as he was cheered on from both Germany and Portuguese fans, ending his international soccer career with 127 apperances and 32 goals. Return from "Luis Figo Biography" to "Famous Soccer Players"
Return from "Luis Figo Profile" to "SoccerManiak Home Page"